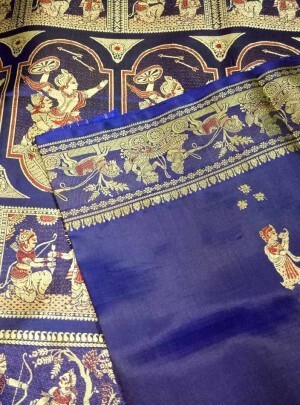 This is an adorable Royal Blue Bridal Swarnachari saree from Bengal. The zari detailing features Shakuntala and deer motifs on a beautiful royal blue color base. The maroon mina work adds eye charming beauty to this saree. Swarnachari is the ideal substitute of banarasi sarees as these are heavy in work and the weaving is done intricately.